The All-Big 12 Conference football teams and individual award winners were announced on Tuesday morning with six Nebraska players being named first-team all-conference selections. Selections are made by the league’s 12 head coaches, who are not permitted to vote for their own players. The first-team selections were led by senior cornerback Prince Amukamara, who was chosen as the Big 12 Defensive Player of the Year. This marks the second consecutive year Nebraska has captured the defensive award following Ndamukong Suh in 2009. It is also the fourth time in 15 years NU has won the Defensive Player of the Year, after Grant Wistrom won the honor in both 1996 and 1997. Amukamara is only the third defensive back to win the Big 12 Defensive Player of the Year honor and the first since Terence Newman of Kansas State in 2002. Amukamara headlined three Huskers who won individual awards from the Big 12. Junior linebacker Lavonte David, the league’s second-leading tackler, was selected as Newcomer of the Year, and freshman quarterback Taylor Martinez was chosen as the Offensive Freshman of the Year. Amukamara is among the national leaders in pass breakups with 13, and is a key to the Blackshirt defense ranking second nationally in both pass efficiency defense and passing yards allowed per game. The 6-1, 205-pound senior was one of five Blackshirts honored as first-team All-Big 12 picks, making the team for the second straight year. The first-team defenders have helped Nebraska lead the Big 12 and rank fifth nationally in total defense. Nebraska’s six first-team All-Big 12 selections were it most since 2000, and the five defensive first-teamers is the most on one side of the ball since NU also had five first-team defenders in 1996, the inaugural season of the Big 12. Junior defensive tackle Jared Crick was a first-team selection for the second straight season. The 6-6, 285-pound Crick has 60 tackles, including 14 tackles for loss and a team-high 7.5 sacks. Defensive end Pierre Allen made the All-Big 12 team for the first time. The Denver native has 51 tackles, including 10 tackles for loss, and a team-high 11 quarterback hurries in his senior season. David was a first-team selection in his first year at Nebraska. The junior linebacker has racked up 128 tackles, 14 tackles for loss, 10 pass breakups and six sacks. He is the second Husker to be named Newcomer of the Year, joining Scott Frost, who captured Offensive Newcomer of the Year honors as a quarterback in 1996. The final first-team defensive selection was senior defensive back Eric Hagg. The versatility of the Peoria, Ariz., native has been crucial for the Nebraska defense. Hagg has 38 tackles, a team-high five interceptions and four pass breakups. The Nebraska offense featured one first-team All-Big 12 selection in senior offensive guard Ricky Henry. The play of Henry has helped Nebraska lead the Big 12 and rank eighth nationally in rushing offense at 269.2 yards per game. In addition to the first-team selections, five Huskers were chosen as second-team All-Big 12 honorees, including Omaha seniors Alex Henery and Niles Paul, who made the second unit at two positions. The most accurate kicker in NCAA history, Henery was a second-team pick for the third straight season at place-kicker. He has connected on 16-of-17 field goals this season and is perfect on 51 PAT attempts, while tying Kris Brown for the school’s all-time scoring record with 388 points. Henery also made the second team as a punter. He averages 43.5 yards per punt and has downed 23 of his punts inside the 20-yard line. The 6-1, 220-pound Paul made the second team as a receiver and kick returner. Paul has 39 catches for 516 yards and a touchdown this season and is among the top five receivers in school history. Paul also averages 25.2 yards per kickoff return and 11.4 yards on punt returns. Senior I-back Roy Helu Jr. also made the second-team offense after posting his second straight 1,000-yard rushing season. Helu Jr. has 1,120 yards and 10 touchdowns and averages 6.7 yards per rush. He racked up four 100-yard rushing games, including a school-record 307 yards against Missouri. Defensively, sophomore end Cameron Meredith and junior cornerback Alfonzo Dennard were chosen as second-team picks. Meredith has 54 tackles, including eight tackles for loss, and 10 quarterback hurries on the season. Dennard ranks second on the team with four interceptions, and has added 23 tackles and six pass breakups. Quarterback Taylor Martinez is the first Husker to capture the Offensive Freshman-of-the-Year award. Martinez has rushed for 974 yards and 12 touchdowns on the season, while averaging 7.3 yards per carry. He is second among all Nebraska freshman in rushing yards in a season and his 1,435 passing yards is the most ever by a Nebraska freshman. Martinez is 26 rushing yards shy of becoming the third freshman quarterback in NCAA history to rush and pass for 1,000 yards in a season. Six Huskers earned honorable-mention All-Big 12 honors. On offense, the honorees included Martinez, junior center Mike Caputo, senior offensive guard Keith Williams and sophomore I-back Rex Burkhead. On defense, senior defensive back DeJon Gomes and sophomore defensive tackle Baker Steinkuhler were honored. Nebraska’s Jordan Hooper captured her second Big 12 Freshman-of-the-Week award in the first three weeks of the season, when the conference office announced its selections on Monday afternoon. Hooper, a 6-2 forward from Alliance, Neb., averaged 20.5 points and 6.0 rebounds in a pair of Nebraska victories last week. She hit 19-of-25 shots from the field, including 2-of-3 three-point attempts in Nebraska wins over Washington State (in Pullman) and Nebraska-Omaha. Against UNO, Hooper scored a career-high 25 points on 12-of-14 shooting from the field. She also blocked a career-high three shots. Her 25 points came in just 24 minutes. In the road win at Washington State, Hooper scored 16 points, including three second-half putbacks to help the Huskers to victory. Hooper also grabbed six rebounds and added two steals against the Cougars. Hooper is tied for second among all Big 12 freshmen in scoring at 17.0 points per game through the first five games of her career. She also ranks fourth among Big 12 freshmen in rebounding with 5.2 boards per contest. Hooper and No. 24/20 Nebraska return to home action on Tuesday night when the Huskers take on UNLV (4-1) at the Bob Devaney Sports Center. Tip-off between the Huskers, who entered the Associated Press Top 25 for the first time this season at No. 24 on Monday, and the Rebels is set for 7:05 p.m. Tickets can be purchased in advance at Huskers.com or by calling 1-800-8-BIG-RED. The game can be heard live on the Husker Sports Network on WOW 105.3 FM-KLNC in Lincoln, Twister 93.3 FM-KTWI in Omaha and 880 AM-KRVN in Lexington. Senior cornerback Prince Amukamara was one of 11 defenders named to the 2010 American Football Coaches Association All-America team, announced on Monday. Amukamara was the only Husker named to the 25-player team, which included four players from the Big 12 Conference. A native of Glendale, Ariz., Amukamara was one of four defense backs on the team. He was joined by Oklahoma’s Quinton Carter, LSU’s Patrick Peterson and Air Force’s Reggie Rembert. Amukamara ranks third nationally with 13 pass breakups this season, a total that is tied for seventh in NU history. Amukamara is also one of three finalists for the Jim Thorpe Award, which will be presented to the nation’s most outstanding defensive back next month. He has also recorded 50 tackles while allowing only 13 completions in the 43 pass attempts opposing quarterbacks have thrown to the receiver he is covering. Amukamara has helped Nebraska rank second nationally in passing defense and pass efficiency defense. Amukamara is the 94th Husker to earn first-team All-America honors. When including two-time honorees, Amukamara’s selection gives Nebraska 108 first-team All-Americans in school history. “Bo and his staff have done some very fine things in the three years he has been at Nebraska. The players have done very well academically, the off-the-field behavior has improved considerably and team chemistry, and unity of purpose have been exceptional. Our team has been well-prepared and played with intensity every week. Bo and his staff have turned the football program in a very positive direction. “I apologize for the events that occurred after Saturday night’s game at Texas A&M. It was a very emotional situation and the mob scene on the field after the game amplified that. Having been involved in a similar situation in 2003 at Missouri, and in witnessing the situation on the field, I made a poor decision in trying to prevent a reporter from recording the scene. I have acknowledged this from the very beginning. Unfortunately, in trying to prevent a scene, I created one. We have been in contact with Brandon Jones and I have apologized to him directly for putting my hands on his camera. I offered to pay for any damages to the camera, but Brandon indicated there were none. -Nebraska senior I-back Roy Helu Jr. rushed for a school-record 307 yards with three touchdowns on a career-high-matching 28 carries. The Danville, Calif., native surpassed the previous school record of 294 yards and six touchdowns on 27 carries by Calvin Jones against Kansas on Nov. 9, 1991. Helu had 228 yards and three touchdowns on his first 10 carries today. He increased his career total to 2,966 yards, while improving his season total to 807 yards. It was his 11th career 100-yard rushing game and first career 200-plus rushing performance. -Nebraska improved to 7-1 for the first time since 2003 with today’s victory. The win over the No. 7 Tigers (AP) marked the highest-ranked team Nebraska has defeated since a 20-10 victory over No. 2 Oklahoma in 2001. The win ended a streak of 12 straight losses against AP top-10 teams. -Nebraska’s win today combined with its win last week against No. 17 Oklahoma State marked the first time NU has defeated top-20 opponents in back-to-back games since defeating No. 12 Texas and No. 6 Tennessee in the final two games of the 1999 season. -Nebraska improved to 5-2 against ranked teams since the start of the 2009 season, including 3-2 last season and 2-0 in 2010. The past two seasons marks the first time Nebraska has posted multiple wins over ranked teams in back-to-back seasons since 2000 and 2001. -Today’s game marked the 12th straight game between the two schools that has been decided by 10 or more points. -Nebraska outscored Missouri 24-0 in the first quarter of today’s game. Coupled with outscoring the Tigers 27-0 in the fourth quarter of last year’s game, Nebraska outscored MU, 51-0, in 30 minutes of action. Ironically, in the other six quarters of action between the two teams over the past two seasons, Mizzou outscored Nebraska 29-7. -Nebraska has scored on its opening possession in six of eight games this season and is 6-0 in those games. NU has five TDs and one field goal on its opening possessions this season. Today’s game marked the fourth time this season Nebraska has scored a touchdown five minutes or less into a game (Western Kentucky, Washington, Oklahoma State). Nebraska has outscored its opponents 76-30 in the first quarter this season. Nebraska’s most points in a quarter this season was 28 in the second quarter of a 38-17 win over Idaho. -Nebraska averaged 19.7 yards on 13 snaps in the first quarter of today’s game. The Huskers also has two one-play scoring drives in the first quarter (two Helu runs) and has five one-play scoring drives this season, with four of those coming on long Helu touchdown runs. Nebraska also has five returns for touchdowns this season. -Roy Helu Jr. ran for a 66-yard touchdown on Nebraska’s first play from scrimmage. He added a career-long 73-yard run later in the first quarter and a 53-yard touchdown run in the third quarter. Helu has six TD runs this season that have covered at least 53 yards, including a 58-yard run vs. Idaho, a 65-yarder at Washington and his previous career-long 68-yard rush at Kansas State, in addition to today’s runs. -Helu moved into the Nebraska career rushing top 10 with the 66-yard run. Helu’s career rushing total now stands at 2,966 yards, putting him in sixth position on the NU rushing list. In today’s game, Helu passed Derek Brown (2,699), Cory Ross (2,743), Dahrran Diedrick (2,745), Lawrence Phillips (2,777) and I.M. Hipp (2,814) on the NU rushing list. Helu rushed for three touchdowns in today’s game, giving him 25 career rushing touchdowns, including eight in 2010. His three touchdowns today tied his career high (vs. Florida Atlantic, at Kansas in 2009). -It was Helu’s 11th career 100-yard rushing game and his fourth of the 2010 season. Helu’s 100-yard rushing games this season have come on 9 (Idaho), 10 (Washington), 8 (K-State) and 28 carries. He reached 100 yards in today’s game on his third carry, his career-long 73-yard run. Helu’s previous career rushing high was 169 yards on 28 carries at Virginia Tech in 2009. -Helu’s 307 rushing yards marked NU’s second 200-yard rushing game of the season, the first being Taylor Martinez’s 241 rushing yards at Kansas State. -Senior kicker Alex Henery connected on a 41-yard field goal in the second quarter of today’s game, establishing a new school record with 18 consecutive made field goals. The previous record of 17 straight was held by Kris Brown. Henery did have a 51-yard attempt blocked in the fourth quarter, ending his consecutive made streak. Henery added four PATs, giving him a streak of 101 consecutive made extra points. He pushed his career scoring total to 358, moving him within 10 points of second place and 30 points of Brown’s school record 388 points. -Sophomore tight end Kyler Reed caught a 40-yard touchdown pass in the first quarter of today’s game. The TD was Reed’s fourth TD catch of the season among his six overall catches. Each of Reed’s four touchdowns have covered at least 33 yards, including a 33-yarder vs. South Dakota State, a 79-yard TD catch at Kansas State and a 41-yarder at Oklahoma State. -Redshirt freshman quarterback Taylor Martinez completed 6-of-9 passes for 115 yards and a touchdown in today’s game, including 5-of-5 for 101 yards and a touchdown in the first quarter. Martinez has connected on 29-of-44 passes in the past two games. -Before sitting out the second half, Martinez rushed 12 times for 16 yards, leaving him 114 yards shy of becoming just the third freshman quarterback in NCAA history to rush for 1,000 yards in a season. He remained third on NU freshman rushing chart and eighth on the Nebraska season quarterback rushing list. -Nebraska limited Tiger quarterback Blaine Gabbert to an 18-for-42 passing effort for 199 yards and one interceptions. Gabbert completed only 10-of-26 passes before halftime, including an interception. -Nebraska junior defensive tackle Jared Crick, one of 12 Lombardi semifinalists, finished today’s game with a season-high eight tackles, including a seven-yard sack, and two tackles for loss totaling seven yards. Crick pushed his season sack total to 4.5 and his career sack total to 14, just two shy of the Nebraska career top 10. Crick also had two quarterback hurries, pushing his season total to seven. -Senior cornerback Prince Amukamara tied his career high with three pass breakups today (also Baylor, 2009), giving him a team-high 10 breakups this season. Amukamara has 24 career pass breakups good for seventh on the NU career pass breakups list. -Senior defensive end Pierre Allen recorded two tackles, including a seven-yard sack in the first quarter. Allen now has 12.5 career sacks, including 2.5 this season. Allen also recorded two quarterback hurries to push his team-high total to 10. -Senior defensive back DeJon Gomes finished the day with four tackles, an interception and two pass breakups. Gomes’ first-quarter interception was the sixth of his career and second against Missouri. He also has five career fumbles caused. -The Nebraska defense finished the day with six sacks for 44 yards, its most since a season-high seven against Idaho. Nebraska has 18 sacks this season. Nebraska also had six pass breakups and seven hurries in today’s game. -Today’s game captains were senior IB Roy Helu Jr., senior OL Keith Williams, senior CB Prince Amukamara and junior LB Mathew May. Longtime Husker fan and all-around good guy Bryce Anderson offered the following commentary, http://www.oldhuskerfan.blogspot.com/, on his Nebraska blog “Old Husker Thoughts” after Nebraska’s 31-17 beat down of Missouri in Lincoln. Huskers 31. Tigers 17. How sweet is THAT score anyway if you’re a Big Red fan??!!! Even 24 hours plus after the happening, those images of pure dominance are still washing through my memory. We haven’t seen a performance like that since–okay, if you want to count the Holiday Bowl against Arizona–but otherwise, it’s been a looonnnggg time since the team put together a high-profile beat-down like this. I know–Roy Helu smashed through the school single-game rushing record. But this Old Husker Fan will go with the line’s performance first–because there were sights for sore eyes on the blocking side of things yesterday. It started with Ben Cotton wiping out 2–count ’em, TWO–Mizzou guys on Helu’s first home run TD. Then it continued with Nick Caputo and Ricky Henery pulling around the right side on Roy H. Jr’s 2nd long TD run–along with pass block pare excellence on the long TD throw to Kyler Reed by Taylor Martinez–a HUGE gap in the middle for Helu Jr’s 3rd hammer shot–and then, with almost 9 minutes left in the game, the classic kill-the-clock drive to seal the game. It’s what’s up front that counts, and the O-line responded. Roy Helu Jr., to me, has been stuck in a “yeah he’s good, but—” type of stature in terms of his place on Husker all-time rushing charts. He took care of that yesterday, didn’t he, with vision, cuts, bursts, and heart that places him in the same breath as Green, LP, Jones, Clark, Hipp, Craig, Berns, Kinney, and even has him sharing some of the same territory as the best back that this fan has ever seen wearing red–Mike Rozier. 307 yards. Three. Hundred. Seven. That number is mind-numbing. #10 in the 2010 Husker lineup brought it all yesterday–and his 3rd TD had a cut and explosion that only the best bring to the party. The best Husker teams have had a defense that flat-out hurts the other guys. Yesterday, we saw that–and Missouri obviously felt it. The sacks that Cameron Meredith and Courtney Osborne put on Mizzou QB Gabbert–and the gutsy goal-line stand 3rd down play where Ciante Evans and Jared Crick helicoptered Gabbert to keep him out of the end zone are proof that this year’s edition of the Blackshirts is dialed into that same perspective. Two new starting safeties. A reserve cornerback playing most of the game. A walk-on D lineman who has never played gets a sack. And a senior #2 quarterback takes over in the 2nd half without flinching. The aforemention Messrs Osborne and Evans, along with new safety Austin Cassidy, Kevin Thomsen and ever-steady Zac Lee can add their names to the stories of big games where heretofore non-headline players made their mark in a very real way. Coaches say all the time that football is a team game–and the Husker program has a history of proving that over and over again. Yesterday was no exception. This is a personal item. I’ve always been a fan of the tight end position on the Husker teams. I know that Johnny Rodgers and Irving Fryar basked in glory as wingbacks/wide receivers–but to me, the true hallmark Husker non-backfield skill position is the tight end. And, what a reminder we got of that position’s prominence yesterday–not only with blocking, but also with #25, Kyler Reed, making 2 huge catches–his 40 yard TD aerial from Taylor Martinez, and then, late in the game, with a tough 12-yard reception on 3rd and 2 during the game-clinching 8 minute, 40-second possession. Of course, this coming Saturday against Iowa State is another must win. After all, Iowa State can win the Big XII North by winning out–and no matter what, the Huskers have zero wiggle room in order to stay on track to go to their final Big XII championship game. But this is one fan who feels a whole lot better about the program going into this week than last week–and for sure better than 2 weeks ago. I think things are looking up, and that they’re looking up for some several definitely vintage Husker program reasons–reasons to savor looking to the rest of the 2010 campaign. Too bad Nebraska can’t get out of Saturday’s game against South Dakota State. Who the heck scheduled this game? Can we somehow blame Bill Callahan for this? Nebraska would have been better off taking a bye week following the 56-21 win over Washington. There’s more on the line here than meets the eye, and NU has to take this game seriously. Maybe the powers that be look at the numbers and say ‘we can’t afford to have an open date.’ No offense, but I’m not sure Nebraska can afford to play a I-AA team at a time when NU is riding a tide of momentum. At this point Nebraska would have benefitted more from a week off. You mean not a single lower-rung Pac 10, Mountain West or Western Athletic Conference, or major independent had an open spot? The Jackrabbits don’t belong in Memorial Stadium and this is the kind of game that Nebraska really can’t win. If I’m an AP voter I would be more impressed if Nebraska took a bye week rather than hanging 60 points on a I-AA team that is 0-2 with losses to Delaware and Illinois State. It was a big deal when Kansas lost at home to North Dakota State in Turner Gill’s first game as head coach. And remember just a few seasons ago when Appalacian State won at Michigan? At least those are nationally ranked I-AA programs. South Dakota State isn’t even on a level with UNK or UNO. The only storyline of note in this game is that former Husker linebacker Clint Brown is the co-defensive coordinator and defensive line coach for the Jackrabbits. Wow, good reason for pay-per-view. Right? Pollsters will yawn even if NU runs up the score on SDSU. If this game is even remotely competitive Nebraska will suffer. It would make more sense to play a I-AA opponent if Nebraska opened the season with a relatively decent schedule in the first three games. But you know things are bad when a struggling Washington team is the best NU can do on the pre-conference schedule. Bo Pelini walked a fine line during this week’s Nebraska football press conference, coming close to being critical of why the game was scheduled. “I think we owe it to the players and the fans to challenge them every week,” he said. The local media may have saved his bacon by leaving this comment out of the papers and off television. Pelini then talked about how some I-AA teams have found success against Division I opponents. “When they come and play (Division I) opponent, those kids want to prove they can play at this level,” he said. This is not the kind of opponent Nebraska needs heading into conference play, especially with a Thursday night game at Kansas State on the horizon. The NCAA allows D-I teams to count one win each season against I-AA teams toward its bowl-qualifying win total. I’m not sure this is good for any national program, let alone a team that has national title aspirations. The Jackrabbits average 8.5 points per game, are just 21 percent on third-down conversions, have given up an average of 224.5 yards rushing, and the largest crowd they’ve played in front of this season was a little more than 19,000. It’s too bad the Big 12 hasn’t found a way to play nine conference games in a season. 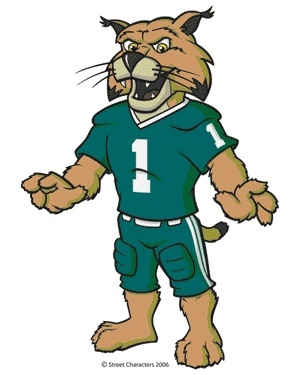 The Ohio University athletic department issued an apology — not for the poor performance of its football team in a blowout loss at Ohio State Saturday (something fans would love to see on so many levels) — but for the actions of the Bobcats’ mascot, Rufus. “We apologize to Ohio State University and its many loyal fans for the poor decision made by the Bobcat mascot in tackling the Buckeye mascot when Ohio State came onto the field during Saturday’s football game. The individual responsible for these actions has been banned from any further affiliation with Ohio Athletics. The Associated Press later reported that guy behind the mascot head, Brandon Hanning, said he planned it all along — to first win the mascot’s job, only to make the trip to Ohio State to tackle the Buckeyes’ mascot. How’s that for a conspiracy? Former Nebraska Head Coach Frank Solich had the most classic response to the AP’s question about the incident following Ohio’s 43-7 loss. “Obviously we needed to tackle the guy with the ball, not the mascot,” Solich said, according to AP. Hanning is a southeast Ohio resident who suited up 15 minutes before kickoff and made his way to the sideline as OSU players took the field. Just as OSU mascot Brutus and a cheerleader hoisted the Buckeyes’ flag Hanning got into position and took his shot as Brutus entered the field. OK, all the self-righteous broadcasters on ESPN apparently didn’t find it to be very funny. I watched college football for the balance of Saturday morning and night, but ESPN never once showed a highlight of what may be the best highlight of the day. C’mon, this is what movies are made of — Ferris Bueller, Dumb and Dumber all wrapped up in one great moment. Reminds me of an experience I had as a student at Nebraska back in the early ’90s. Nebraska was playing Utah State and sometime in the first half Herbie the Husker stumbles up to the student section, high fives are flying and Herbie hits the ground — as sick as a dog. He was obviously drunk. Then play was interrupted by this nasty thunderstorm.